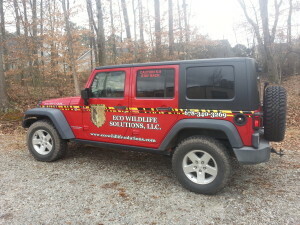 We are very proud to introduce everyone to the Eco Wildlife Solutions, LLC Graphics Package. We worked in conjunction with Henson’s Signs and Graphics in Newnan, GA on designing and installing our new graphics package. We will be working with them on implementing this design on our fleet in the near future. 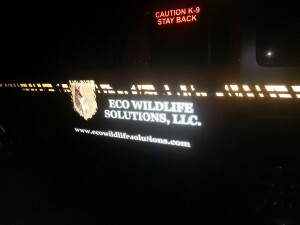 Due to our 24 hour policy for emergency removals we opted for total coverage of graphics utilizing 3M Scotchlight Reflective Decal materials for our safety and visibility while operating after dark . Night Time Operating Visibility Issues are a thing of the past. If you happen to see one of our vehicles around your area give us a honk of the horn or a wave of your hand. We appreciate your opinion on the final product and hope to hear from you with your comments. 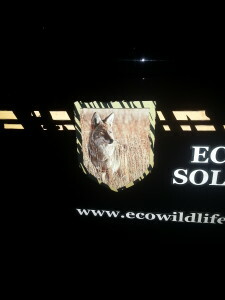 Close up of our Eco Wildlife Solutions, LLC Badge in total darkness.